Thai cuisine is my most favourite cuisine after Indian cuisine. I can eat Thai foods everyday without any fuss especially their Pad Thai Noodles, but dont laugh i took almost 5 years to post this recipe today in my space eventhough PadThai noodles is often prepared in my kitchen. Dunno why sometimes i dont take pictures to write about, this happen often with me and trust me i have to write about a couple of basic and most often cooked recipes in my kitchen. Dishes like Bhatura, Pindi channa,Poori, Appam also join my list to be posted. Dunno when am gonna write,God only knows.Coming to Thai cuisine, its easily available for me as am in living in Paris China town, just in front of my appartment i have Vietnamienne,chinese and Thai restaurants. Whenever we crave for their food, just we go and get our foods from those restaurants, however i love to replicate their dishes at home as their products are available easily for me. Rice is the staple food in Thailand, their favourite curry paste are well known around the world. Thai desserts prepared with fresh fruits or coconut milk is quite popular too. Since am a ardent fan of Thai dishes, i always want to visit Thailand atleast once in my life to taste the original Thai dishes. After North American Californian Cuisine, our this month's challenge of International Food Challenge ,a monthly event started by two wonderful food bloggers Sara and Shobana,we are landing towards Northern Thai Cuisine, the host of this month is Sangeetha Priya. Sangeetha suggested super duper delicious dishes from this cuisine. The famous banana coconut milk dessert which taste like rum was in my to do list until last week,but my sudden visit to chinese store changed my mind and i ended up making our family favourite Pad Thai noodles but as vegan version. 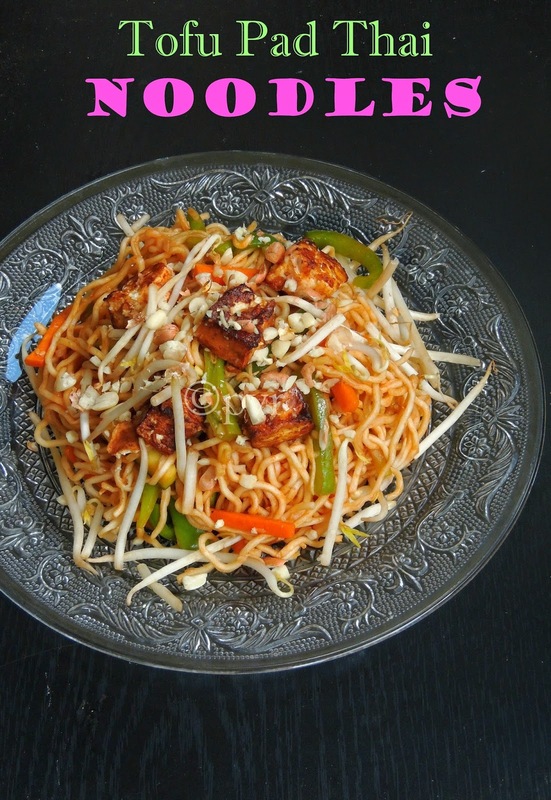 Tofu added to this noodles turns this dish more interesting and the proteins in tofu gives some extra nutritious value to this vegetable loaded vegetarian Pad Thai Noodles. If you are noodles lover, make this simple and delicious noodles and enjoy it.Sending this post to Ahlan Ramadan-The Healthy Way. Add the chilly sauce, soya sauce, cornflour,oil to the cubed tofu cubes, coat them well,keep aside for half an hour for marination. In a flat tawa, drizzle some oil and fry the tofu in low flame on both sides until they turns golden brown. Remove and keep aside. Meanwhile cook the noodles in hot water until they turns partially cooked, dont overcook the noodles as they tend to cook while cooking again. Drain and wash the cooked noodles thoroughly with cold water. Mix the tamarind sauce, brown sugar, red chilly sauce, soya sauce in a bowl and keep ready. In a wok, heat oil, add the sesame seeds let it cracks. Add the vegetables and let them gets cooks partially, add the already prepared sauce and cook for few minutes. Now add the cooked noodles, bean sprouts (keep aside few), pan fried tofu (reserve few for garnishing), toss everything gently. Finally add the pepper powder, chopped mint and toss again everything. 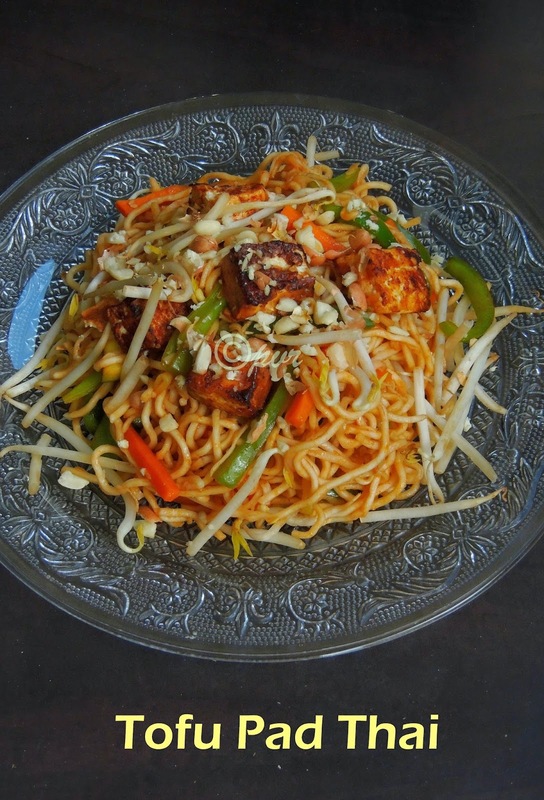 Serve hot the noodles topped with pan fried tofu, bean sprouts and crushed peanuts. Wonderful Dish, I liked the pictures. My fav too..... Noodles looks tempting and colorful !! Gawd ! Is there any cuisine you haven't managed to Master Priya ?? Noodles looks delicious and healthy too.. This is my kind of delicious and healthy dish! U had noodles without me not fair at all Priya!Looks so yummy..never knew tamarind juice could be used in noodles. I love pad thai! It is one of those great recipes that you can use up leftover veggies. what a flavourful dish wish to have this for my lunch!So yum! I can finish the whole plate now.....super tempting pad thai Priya akka. super delish tofu pad thai and thanks for mentioning sis!! !